There’s something shocking about Apparition Foretold, Throbbing Gristle’s first ever Scottish performance designed as a precursor to Apparition, their gallery collaboration with Cerith Wyn Evans, set to run throughout August and September, 2009. It’s not that the band formed in the late 1970s out of avant-provocateur art troupe COUM Transmissions, and subsequently dubbed ‘Wreckers of Civilisation’ by Tory grandee Nicholas Fairbairn are blurting out some aktionist Noise assault á la the current wave of sonic terrorists Genesis P-Orridge, Cosey Fanni Tutti, Peter ‘Sleazy’ Christopherson and Chris Carter inadvertently inspired. It’s just the opposite, in fact, as the quartet revisit their past with an air of cosy vindication that’s now far easier to contextualise than it was three decades ago. Growing old gracefully? Maybe, but the disparate mix of leather-jacketed punks and bright young things from Glasgow School of Art’s MFA opening in the room next door, remain studiously intent on clinging to the TG (self) mythology lest some acquired notoriety leave its sticky traces behind to rub up against. Over two very different light-and-shade sets, TG mine everything from primitive Electronica, proto-Techno and a curiously domestic-sounding Dub, all of which set the machines in motion for and pretty much predicted the future. 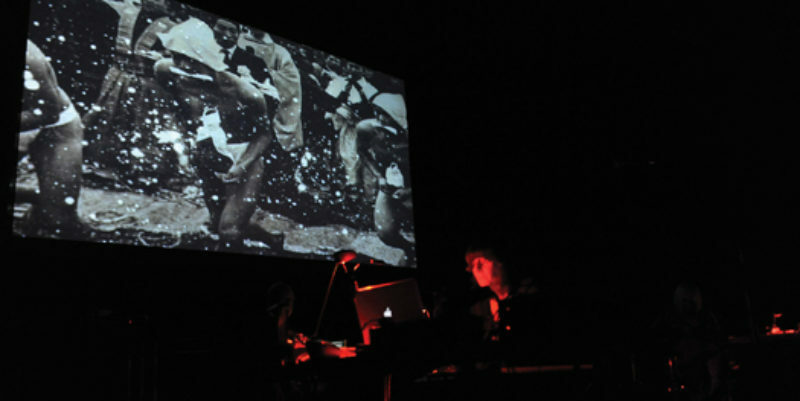 In darkness, Carter and Christopherson line up at the back of the stage before appositely hi-tech laptops, with Tutti and P-Orrridge bent in equal measures of concentration over a raft of equipment. Over a half-hour instrumental accompaniment to Evans’s flickering monochrome stills of fetishised oriental exotica, TG nevertheless manage to conjure up a set of churningly insistent analogue rhythms that sound like they’ve been unearthed from a skip left over from the late 1970s winter of discontent’s bin-man strike. Beyond the film, the most striking visual comes at the piece’s conclusion when Christopherson is moved to pick Tutti off the ground with an all-engulfing bear-hug. The lights are kept glaringly up for the greatest non-hits set that follows, a basic alienation device, designed, one presumes, to keep the audience focusing solely on the music, with any potential for industrial dance-floor catharsis stymied at birth. It also allows, however, for TG’s different personalities to come into focus. If Carter is the passive boffin to Christopherson’s magisterial alchemist, then Tutti—clearly having a ball as she bashes away at her guitar or else blows a discordant squeak from a sparkly scarlet cornet—is the impish sprite to P-Orridge’s drama queen. Sporting a peach-coloured blouson and Brian Jones bleach-blonde bowl-cut that matches the white violin he intermittently scrapes, and looking more, well, manly than his well-documented series of body-modifications suggest, P-Orridge is the unashamedly emotional heart of TG as well as its vocal centre. Then again, revisiting the insistent sludge of ‘Persuasion’ and burns victim lament, ‘Hamburger Lady,’ was never going to be a passive affair, even if after 33 years P-Orridge and co do know what they’re doing now. The kitchen-sink reggae clatter of ‘What A Day’ and Sturm und Drang of ‘Discipline’ are both precursors to The Prodigy’s mid-1990s confrontationalist stance. Here, though, such taking stock is imbued with apposite melancholy. Especially following the reignited TG’s most recent anthem, ‘Almost A Kiss,’ from the 2007, ‘Part Two:The Endless Not’ album. On this warped Torch ballad of unrequited yearning, P-Orridge’s cracked rasp lays bare something else not normally associated with TG; Soul. It’s a beautiful moment in an evening of surprising warmth.